A variety of bulk polymers for the selective separation of chloramphenicol were synthesised from 2-vinylpyridine, diethylaminoethyl methacrylate or methacrylic acid monomers. Chromatographic evaluation indicated that chloramphenicol was retained under nonpolar elution conditions (k = 58.65) through selective hydrogen bonding and ionic interactions. The retention of chloramphenicol under aqueous elution conditions (k > 100) results from nonselective hydrophobic interactions. Under nonpolar elution conditions, the functional monomer employed imparted a significant influence on the recognition properties of the corresponding polymer. After solid-phase extraction using a molecularly imprinted polymer as sorbent and either an organic or aqueous washing solvent, nearly 100% recovery from the chloramphenicol standard solution was achieved, and nearly 90% recovery could be attained from spiked honey samples. 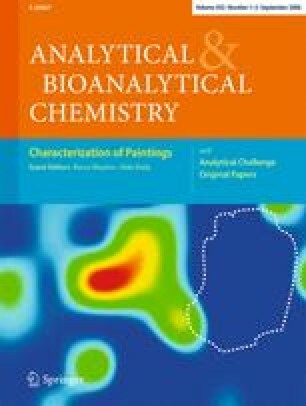 The molecularly imprinted polymer was well suited to suppress matrix effects, and provided optimal preconcentration of the target molecule (chloramphenicol) prior to chromatographic analysis.